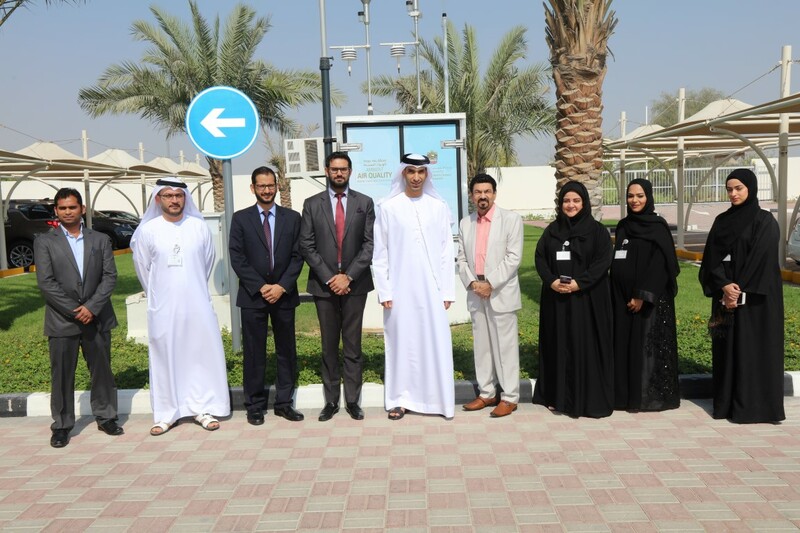 DUBAI, 20th October, 2018 (WAM) – Dr Thani bin Ahmed Al Zeyoudi, Minister of Climate Change and Environment, inaugurated an ambient air quality monitoring station at the headquarters of the Ministry of Climate Change and Environment in Dubai. The station has been developed in partnership with BDH Middle East, a leading global supplier of the widest range of chemicals, glassware, apparatus, lab instruments, microbiology media, bio-chemicals, diagnostics and other laboratory products from a single source in the UAE. The station is equipped with gas sensors for nitrogen oxides (NOx), sulfur oxides (SOx) carbon monoxide (CO), and ground ozone (O3). Apart from the gas sensors, the device comprises dust particle sensors for detecting PM10 and PM2.5 sized suspended particulate matter in air, as well as temperature, relative humidity, wind speed and direction sensors for accurate measurement and analysis of pollution parameters. Dr Al Zeyoudi said: "Ambient air monitoring is an integral part of effective air quality management. In the UAE, air quality is a priority given the direct and indirect implications it can have on health, the economy and the environment. The National Agenda of the UAE Vision 2021 outlines as one of its objectives the improvement of the air quality by 90 percent over current levels by 2021." The Minister added: "Air monitoring stations keep air pollution in check, mainly around urban areas that see far higher concentration levels of pollutants. The readings they provide play a vital role in making informed decisions to help the nation achieve its targets. We are confident we will see enhanced projects and initiatives that aim to cut down the levels of pollutants emitted into the air we breathe." The new station is the latest addition to the existing 41 air quality monitoring stations operational across the UAE that conform in their specifications with stations approved by the European Union and the US Environmental Protection Agency. In September 2018, MOCCAE launched the UAE Air Quality Index (UAE AQI) on its smart application. The index displays real-time readings of the satellite-monitored air quality index (AQI) across the UAE. Using specific algorithms, it forecasts the AQI status for up to three days in advance, in addition to predicting the concentration of dust and PM2.5 sized suspended particulate matter. The satellite readings complement the output of the 42 stations now functioning in the country and result in highly accurate and reliable data.